Egypt’s parliament is scheduled to discuss and vote on laws related to a number of issues next week, including new measures aiming to fight monopolistic practices and other issues that affect the price of consumer goods. On Sunday, parliament is expected to take a final vote on laws fighting monopolistic practices, regulating the medical profession and the education sector, and establishing a higher council for the physically challenged. 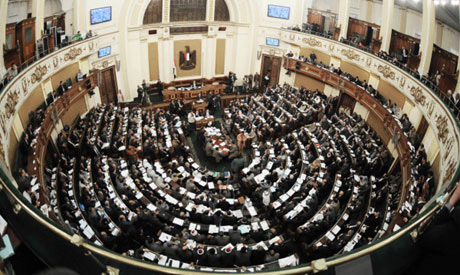 Parliament is also expected to begin discussing a government-drafted law aimed at setting up a body regulating national and international land transport in Egypt. Other laws regulating public shops and the inspection and handling of food products on the local market are also expected to be debated on Sunday or Monday. On 8 December, parliament approved most of the amendments to law no.3 of 2005 on the protection of competition and the prevention of monopolistic practices. Speaker Ali Abdel-Aal decided that the final vote on the amended version of the law was postponed due to the lack of a quorum. "This is a law which requires a quorum of a two-third majority of MPs as it represents a basic part of the constitution and because it tackles the issue of free trade," he said. A report prepared by parliament’s legislative and constitutional affairs committee and the economic affairs committee said the flotation of the Egyptian pound and the elimination of a large amount of fuel, power, and water subsidies had led to monopolistic practices and the manipulation of the prices of essential products on the local market. The new amendments introduce the crime of hoarding strategic goods such as petroleum products, with the aim of driving up prices. Those found guilty could face a jail sentence ranging from one to five years and a fine of EGP 100,000 to EGP 1 million. The changes also impose penalties on smuggling petroleum products, and other products prohibited for export, that amount to jail sentences ranging from three to seven years and fines of EGP 100,000 to EGP 2 million. The cabinet decided at its weekly meeting on Wednesday to introduce additional amendments to the anti-monopoly law (law no.3 of 2005) and refer them to parliament. A cabinet statement said the additional amendments aim to give greater powers to the apparatus on the protection of competition and the prevention of monopolistic practices. "The apparatus will be directly affiliated with the cabinet and prime minister himself, in order to give it the power and flexibility enough to address harmful monopolistic practices on the market," said the statement, indicating that "the amendments also prohibit rival competitors in the market – individuals or entities – from concluding an agreement or contract or joining other forces in a direct or indirect way, with the harmful purpose of raising or lowering or stabilising the prices of certain products on any market, or with the intent of dividing the market among them." "It is also prohibited that market competitors join forces to abstain from submitting bids in a public tender, or work together to restrict the manufacture, production, distribution and marketing of certain products, with the objective of manipulating the market and manipulating the prices of these products," said the statement. It also indicated that the apparatus will be tasked with receiving reports and complaints on certain monopolistic practices. "The apparatus will inspect them, collect information on them, and decide whether the practices are monopolistic, and if yes, it will move to take the necessary measures to contain such harmful activities," said the statement, adding that "the amendments also entrust the apparatus with preparing an integrated database on economic activities and businesses, as well as research reports that all should help safeguard the local market against harmful monopolistic and shady practices." On 9 December, Abdel-Aal said the amendments to the anti-trust law are very important to help discipline the local market and crack down on those who tamper with subsidised products and ensure that ordinary citizens get essential goods at reasonable prices. The report prepared by parliament's committees says that the new amendments aim “to stem the tide of high prices on the local markets." "Watchdog authorities have noticed that a handful of importers and merchants have exploited the liberalisation policies to double their profit margins in an illegal way and exaggerated way," read the report, indicating that "the amendments give greater powers to inspectors affiliated with Ministry of Supply, the Consumer Protection Agency, and the Ministry of Interior's Supply Control Department to help them discipline the local market, contain high prices, ensure that limited-income consumers get essential goods and products at reasonable prices, and tighten the grip on monopolistic practices." It said that these legislative initiatives come in response to parliament and MPs “who have always pressured the government to check monopolistic practices and give consumers all needed protection." On Monday, Agriculture Minister Ezzeddin Abu Steit will be required to answer 65 questions and information requests submitted by MPs. "Minister Abu Steit will answer questions on monopolistic practices in the sugar market, and indicate the government's strategy in standing up to rampant monopolies in the area of trade of fertilisers, pesticides, and seeds, containing prices of certain major agricultural crops, and helping safeguard farmers against private monopolisers and manipulators," said a parliamentary statement.